Special thanks to Bamboo Catering for extending this catering review invitation. Besides providing cooked food for family and corporate events, Bamboo also specializes in do-it-yourself steamboat packages. Apart from a cooking pot, a stove and tableware, everything else needed for a steamboat meal comes in a box and is delivered right to the customer's doorstep. Note that Bamboo's products are certified halal. 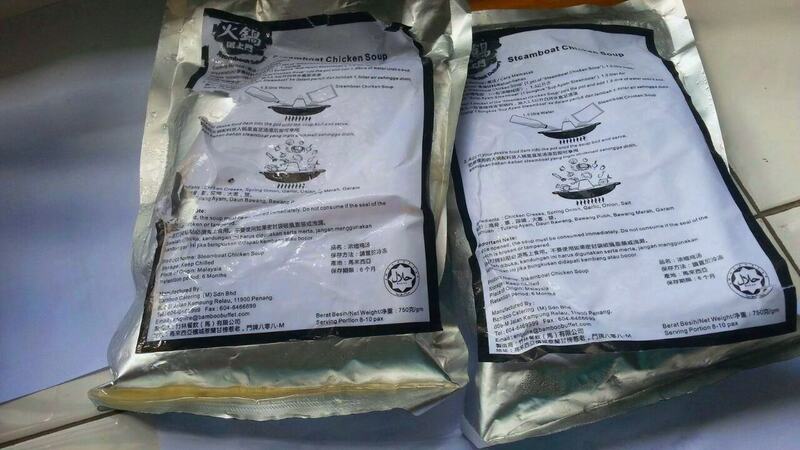 Steamboat soup is provided in sachets of concentrated chicken stock (竹林清鸡汤). The stock, made by simmering chicken bones, includes natural ingredients such as onion, garlic, scallion (spring onion) and salt. To prepare soup for steamboat, empty a sachet of chicken stock into a pot and add water. Bring the mixture to boil and steamboat items can now be added. Each sachet provides sufficient soup for 8 to 10 persons, so I am not sure whether the second sachet is necessary. Most of the steamboat items remain frozen upon arrival, so it is advisable to thaw them for a while before the meal. This is particularly true for the Fresh White Prawns (白虾). I learned this the hard way. The shrimps are surprisingly large in size. Once cooked, the texture of shrimps is still crunchy, a hallmark of their freshness. As for Fresh Fish Fillet (鲜鱼片), red snapper (红狮鱼) is used. Its refined texture and delectable flavor make the fish another commendable aspect of this meal. The same can be said for Fresh Squid (鲜墨鱼). Its chewy texture presents an appealing sense of mouthfeel. As for poultry, the box of Minced Chicken Meat With Egg (免治鸡肉) includes a raw egg, which is meant to be mixed with minced chicken before cooking. Unfortunately due to rough handling during shipping, the egg (as well as many other eggs in a separate box) has been broken. Luckily the container box remains chilled upon arrival; otherwise the chicken would have been contaminated and rendered unsafe for consumption. I generally skim through processed food in steamboat meals. This is simply because these items can be easily found at supermarket stores. However, Bamboo uses several premium types which I think deserves mentioning. First, there are Salmon Balls (三文鱼丸) and Seafood Sandwich Tofu (海鲜三文治). The former has a unique taste on its own. Another container contains Filament Sticks (蟹柳) and Square Seafood Taufoo (豆腐鱼丸). Be careful while biting the latter because the interior can be piping hot! Cheese Fish Balls (芝士鱼丸) contain cheesy paste as fillings. This item is quite special compared to other processed food, but I ultimately still prefer the fresh seafood and minced chicken. Hock Chew Fish Balls (福州鸡肉丸) are shells of springy fish paste with minced chicken as fillings. I wish that the fillings were more compact so that there is less "loose" space. Japanese Beancurd (日本豆腐) is also provided. However its delicate texture causes the bean curd to break easily in the pot. Personally, I prefer firm bean curd when enjoying steamboat. Mushrooms are among my favorite steamboat items. In this package, two types are provided: Almond Mushroom (杏鲍菇) and Fresh Enoki Mushroom (金针菇). As for condiments, four types of sauces are provided: special chili sauce (特制辣椒酱), spicy ginger sauce (姜茸酱), onion soy sauce (洋葱酱油), garlic oil (大蒜油). The onion soy sauce is probably most suited for my palate, although I appreciate the special chili sauce too. Meanwhile, the garlic oil remains frozen over; this explains its peculiar custard-like appearance. Overall, I think Bamboo's steamboat is reasonably enjoyable by virtue of its fresh seafood and minced chicken. The soup can be overpowering, so I will make it more diluted next time. After all, the soup's flavor tends to become richer as more ingredients are added into the pot. I find the pricing of Bamboo's steamboat to be somewhat similar to steamboat restaurants. There are pros and cons of do-it-yourself steamboat as compared to steamboat restaurants. On the plus side, you do not need to travel outside especially when there is a large party to feed. On the other hand, there is some preparation work before the meal and cleaning-up afterwards. 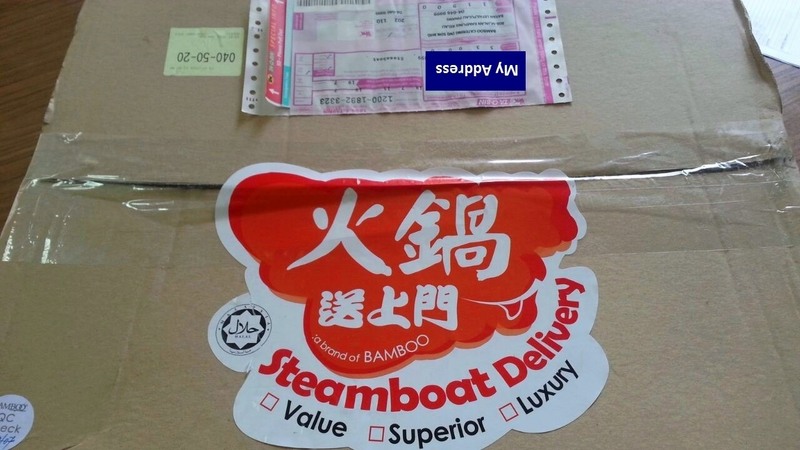 Bamboo's steamboat packages can be ordered online. The delivery areas are Penang, Klang Valley, Ipoh and Johor Bahru. Customers can select the desired delivery time, which is anything between 8:00am and 9:00pm. Delivery is also available on weekends and public holidays. Personally, I advise that you arrange for delivery around 3 hours before the meal. This is to give yourself sufficient time to prepare the soup and allow frozen items to thaw adequately.